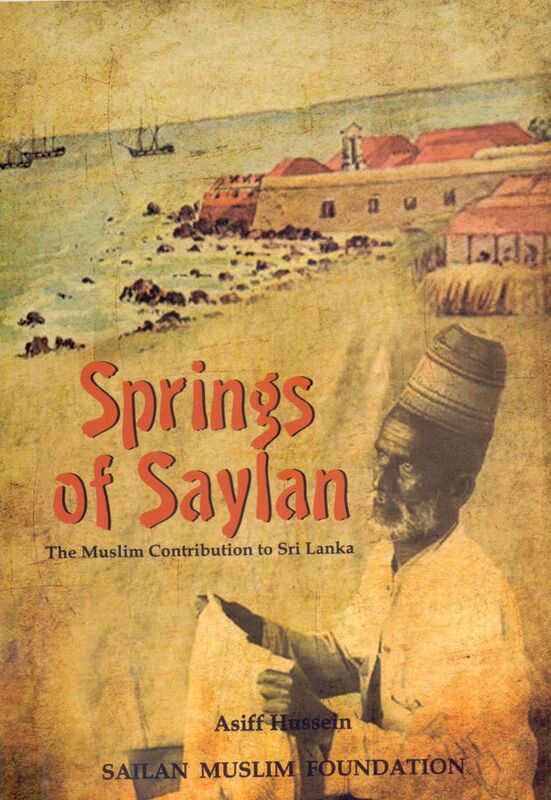 Springs of Sailan is a compendious work on the Muslim contribution to Sri Lanka authored by Asiff Hussein and published by Sailan Muslim Foundation. The Muslims of Sri Lanka have for long lived in peace and harmony with the other communities that have made Sri Lanka their home. They have contributed immensely to the culture, economy and the national life of the country. Unfortunately, this contribution is not much known due to the dearth of information on this subject, as a result of which an impression has been created that the Muslim contribution to the nation has been minimal and that their main occupation of trade has only benefitted themselves and not the country as a whole. The purpose of this work is to debunk these misconceptions and record for posterity the healthy tradition of co-existence Muslims have enjoyed with the other communities of the island and their immense contribution that has enriched the culture of our beautiful island, as well as their role in the national economy and struggle for independence and peace building. The work begins with the historical evidence for existence between Muslims and other communities including peaceful settlement as merchants, intermarriage with other communities and adoption of the local languages and other cultural traditions such as ge-names. As importantly it deals with the Muslim cultural impact on local society with regard to food, beverages, articles of dress and pastimes. Little is it known that it were the Muslims, mainly Malays who gave us such cultural items as aluva ‘a traditional sweetmeat’; dodol ‘an oily sweetmeat’; bibikkan ‘a coconut cake’; achcharu ‘pickle’; sambola ‘sambol’; sarama ‘sarong’; saruvalaya ‘baggy trousers’; karabu ‘fancy ear ornaments’; pilakku ‘nose ornaments’; rabana ‘one-sided drum’ and sarungal ‘paper kites’. Also dealt with at length is the Muslim contribution to nation building from time immemorial including their support in the national struggle for independence ever since the days of colonial rule by serving as soldiers and ambassadors and their commitment to freedom of the country from British rule and the immense sacrifices they made to safeguard the country from the threat of separatism. Finally, the Muslim contribution to the national economy is covered in much detail including the import-export trade which brought in new things and much needed foreign exchange and internal trade which ensured the smooth functioning of the communities they served in supplying their daily needs of articles such as salt, dry fish and items of dress, besides helping transmitting new ideas from one village to another. Also covered is the contribution to the economy in terms of industrial activity in areas like garments, paints and jewellery. This book, it is hoped, will play its part in adding to the healthy tradition of co-existence between the various communities of Sri Lanka and nurture a peace-loving and pluralistic society where all understand one another better in the knowledge that we share so much in common including genes and cultural traditions that have only enriched our nation for the better.